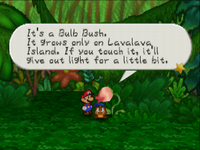 The Bulb Bush is a type of plant that is found during the events of Paper Mario. They appear more as a flower, with the bulb mainly pink, along with a white stripe in the middle and a dark red color at the tip. These plants grow exclusively in the Jade Jungle, located on Lavalava Island. Mario encounters many of these plants while searching for the five Baby Yoshis after they get lost playing Hide 'n' Seek. Whenever Mario examines or whacks one of these plants, they will light up and make a hollow sound. It's a Bulb Bush. It grows only in Lavalava Island. If you touch it, it'll give out light for a little bit. It also wiggles a little and will sometimes surprise you. I doubt it would surpise me. This page was last edited on February 16, 2018, at 17:20.